Technology has truly taken over the world. Now it’s incorporated in daily routines and schedules. Various businesses, institutions, and people are integrating new technologies into their establishments and institutions to make things productive and efficient. Soon enough, there will be no need for papers, pens, and things of the analog era. Everything will be fully automatic with the press of a button or a swipe or touch of the screen. Microsoft is helping to build that future as well with their Surface Hub 2. It’s the size of a whiteboard but with all the functionality of a tablet. It has certainly changed the interactivity and productivity of workspaces and business meetings. With a huge HD display, it’s sure to burn a hole in anyone’s wallet, but if you’re a start-up company, a big corporation, or a large entity, then Surface Hub 2 is an essential tool for you. Many use a PC or tablet to make documents, graphics, and other important presentations that the business or establishment needs. Having those documents and files is crucial, but presenting them with a projector now seems inconvenient when compared to using the Microsoft Surface Hub 2. It has wireless technology and USB ports. You can easily transfer or send the file from your device, and now it’s on a bigger and HD-quality screen for your team, class, or workmates to see. 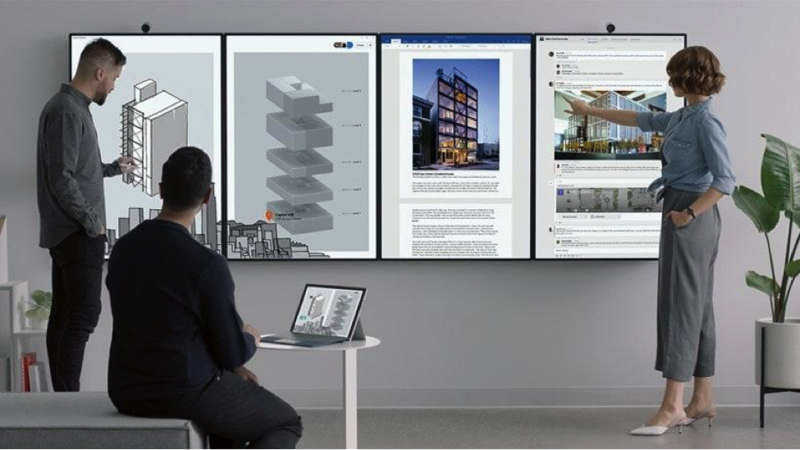 The Surface Hub 2 is the size of a whiteboard or TV nowadays, and with its PC and tablet functionality, it can make discussing projects easier. Microsoft Surface Hub 2 comes with two pens and a wireless keyboard with a built-in touch pad. For huge businesses or corporations, one Microsoft Surface Hub 2 may not be enough for your business meeting. To make things simpler, you should invest in Surface USB-C adapters to connect to USB-C to HDMI adapters by Juiced Systems, which give more ports for the price of one. The Surface Hub 2 is a huge piece of technology. Microsoft collaborated with workspace specialist Steelcase and designed easy-to-hang wall mounts and rolling stands, allowing it to move as your creative and ideas move as well. USB-C to HDMI adapters are convenient tools that these big displays would clearly need since you can put them on a wall side by side. The Microsoft Surface Hub 2 display is one of the best, having a resolution of 3840 × 2160 at 120 Hz with 100-point multitouch and the Quadro K2200 graphics card by NVIDIA. Its processor is the 4th Generation Intel Core i7, with a 128 GB SSD hard drive and an 8 GB RAM. Those specifications are outstanding for a gadget its size. It also weighs 105 or 280 pounds, depending on how big of a screen you need. Having access for both wired and wireless is a neat feature that the Surface Hub 2 has, but what it doesn’t have is a USB-C to HDMI adapter. Technology that comes along with the Surface Hub 2 is not cheap. Its price ranges from $8,999 to $21,999 depending on the size. It is expensive, but it’s well-known that quality usually comes at a price.